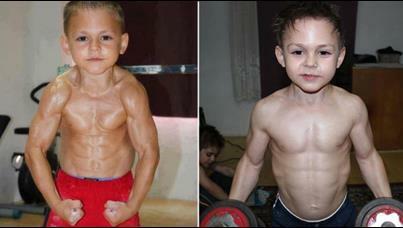 Giuliano and Claudiu Stroe nine and seven years old from Romania have sculpted body frame, which is due to their two hours of rigorous training. Giuliano Stroe in a very short time of 9 years has broken two world records of 90 degrees vertical press ups and another of holding on to a pole with body held out horizontally like a flag. Seven year old Claudiu Stroe is following his elder brother Giuliano’s footsteps and is able to perform handstand press ups on a bar; and trying his hand on his elder brother’s flagpole trick. At a very tender age of 9 and 7 Giuliano and Claudiu don’t even think a second to lift 4 kg dumbbells and frequently lift heavy weights to build their biceps and chest muscles. Fitness regimes of both the brothers is taken care by their father Lulian. He hopes to see his boys achieving international stardom in near future. He also expects that soon his family will be having a Hercules Fame and fortune. In spite of continuous hard work by the team of father and sons, Stroes findi it difficult to get the earnings as per their hard work and talent. Stroes from Romania tried their luck in Italy for a small period of time, hence they managed to earn a title of Hercules body building family but not enough money to keep up their regimes going. Therefore Luliana is back with his family in Romania and have started scrap metal dealing, which limitedly funds the extensive training of the boys. Luliana seems to be a ambitious father; his ambition is to get his sons fame and fortune. Well all we can wish them is good luck for their future endurances.